Oprah unveiled the September cover of O, The Oprah Magazine on Instagram today, and holy hell is it amazing. Oprah chose not to go the “fall fashion” route and instead hosts a hair extravaganza that teaches her disciples how to “grow it,” “blow it,” and “awesomely ‘fro it”. And why wouldn’t we take advice from Oprah? She’s pretty much the guru of awesomely ’fro-ing it. Just check out the size of the herenormous Afro on the cover. She looks like the love child of Diana Ross and Chaka Kahn (“plus two other people,” she remarks). The wig, designed by stylist Kim Kimble and wrangled by Andre Walker, weighs 3.5 pounds (or the size of a small Chihuahua). 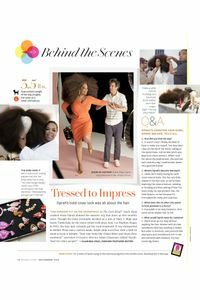 When best friend Gayle saw the wig during the shoot, she quipped, “Can someone put on the soundtrack to The Lion King?” She should be an entry in Afros: A Celebration of Natural Hair. It must be said, a wrap dress and a yappy toy-dog-sized Afro is an incredibly slimming combination: Oprah looks svelte! Is Blake Lively Becoming a Designer? Next articleParis Hilton: Is Burglary Part of Her Brand Now?